Deux-Sèvres is a department in western France, in the Nouvelle-Aquitaine region. Deux-Sèvres means literally "Two Sèvres": the Sèvre Nantaise and the Sèvre Niortaise; these are two rivers which flow through the department. Deux-Sèvres is one of the 83 French departments made during the French revolution, on 4 March 1790. The new department had six districts: Melle, Niort, Saint-Maixent, Parthenay, Thouars and Châtillon (today Mauléon). 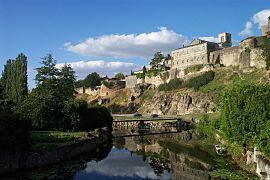 The capital (now prefecture) was Niort alternating Saint-Maixent and Parthenay but soon only Niort was the only capital. 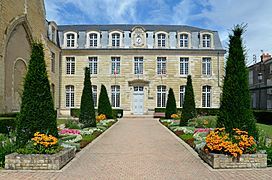 In 1800, with the creation of the arrondissements in France, the six districts were changed into four arrondissements: Melle, Niort, Parthenay and Thouars. Thouars was changed by Bressuire in 1804. On 10 September 1926, the arrondissements of Bressuire and Melle were eliminated. On 1 June 1942, Bressuire was again an arrondissement. 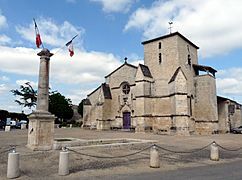 The borders of the department were changed in 1973 when the inhabitants of the little commune of Puy-Saint-Bonnet joined the commune of Cholet in the neighbouring department of Maine-et-Loire. Deux-Sèvres is part of the Nouvelle-Aquitaine region. It has an area of 5,999.4 km2 (2,316 sq mi). The highest point of the department is Terrier de Saint-Martin, 272 m (892 ft) high, in the commune of Saint-Martin-du-Fouilloux. The department is bordered by the departments: Maine-et-Loire, Vienne, Charente, Charente-Maritime and Vendée. Sèvre Niortaise, that flows through the southern part of the department and ends in the Atlantic Ocean. Sèvre Nantaise, that flows through the northern part of the department and is tributary of the Loire river. Thouet, that is also a tributary of the Loire. The department is managed by the General Council of the Charente in Niort. Deux-Sèvres is part of the region of Nouvelle-Aquitaine. There are 3 arrondissements (districts), 17 cantons and 297 communes (municipalities) in Deux-Sèvres. The inhabitants of Deux-Sèvres are known, in French, as Deux-Sévriens (women: Deux-Sévriennes). Deux-Sèvres has a population, in 2013, of 371,632, for a population density of 61.9 inhabitants/km2. The arrondissement of Niort, with 210,986 inhabitants, is by far the largest. The other two, Bressuire and Parthenay, have respectively 96,297 and 64,349 inhabitants. 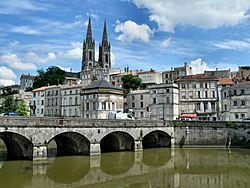 The city with more people living in it is Niort (57,393). The department is still a very rural area, with a large proportion of the land of the departmen used for farming. Wheat and oats are the main products grown, as well as potatoes, apples, and walnuts. Vineyards are numerous in the north. Deux-Sèvres Facts for Kids. Kiddle Encyclopedia.